This is the 3rd week of our Herbal Medicine Chest. Check out the other posts in this series by clicking on the Herbal Medicine Chest page tab or the button to the left. Join us every Monday for the next several weeks to explore herbal preparations and put together your own Herbal Medicine Chest. See the linky at the end for herbal recipes from others. Don't forget to check the comments section of each week's post to read the remedies shared by savvy folks who aren't blogging. Here's yet another group of herbal preparations that are the same and yet different. The goal is to extract the properties of the herbs in question, but the means used to do that depends on the end application. What I mean by that is, who's going to use it and how? The equipment needed for these preparations includes large glass jars with lids, cloth for straining, a fruit press or other means to press the plant material after steeping, various menstruums as described below, dark glass jars for storage and maybe a funnel. As with all preparations used internally, adjust the dosage by weight of the individual. Half to 3/4 strength for weak or low weight adult sized individuals; 1/2 for older children; 1/4 strength for small children; 1/8 for toddlers. Again, as I've mentioned elsewhere, please view this info as a record of my journey and strictly as a springboard for your own herbal preparations. Do your research before using any herbal preparation to ensure it's safety for the user and required dosages. *Keep in mind that the potency of homemade herbal remedies for internal use is hard to standardize. All of these preparations can be purchased from reputable companies where they are standardized in a lab to insure dosages deliver the correct amount of the remedy. This is especially important when treating children or when using stronger herbs where overdose is possible. For a much more detailed explanation of these processes and the chemistry behind herbal preparations you can purchase The Herbal Medicine-Makers Handbook. Click on the link at the left to purchase from Amazon. Also go to Mountain Rose Herbs as one source for prepared herbal remedies and ingredients to make your own. Click on the banner below to see what they offer. Also in our introduction to this series, we offered other companies that provide equipment, ingredients and herbal preparations. See that article @ Herbal Medicine Chest - Where Do I Begin? 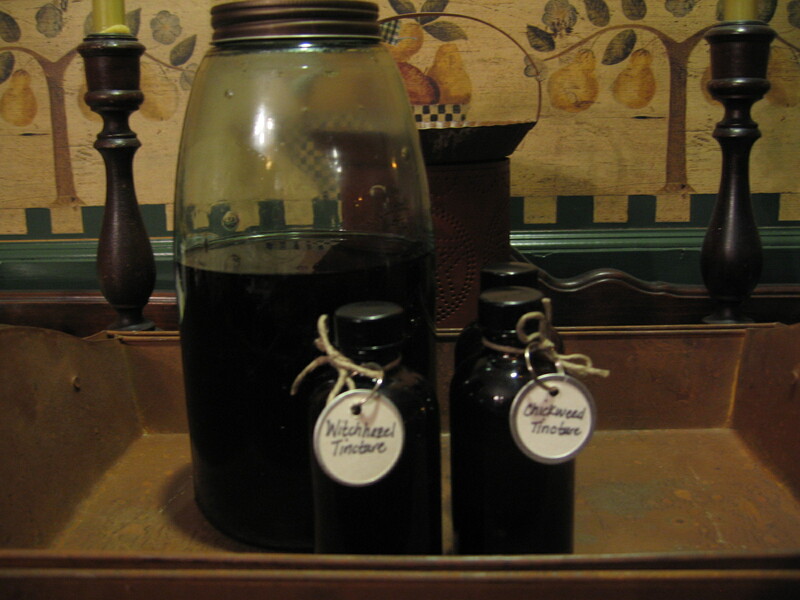 Tinctures - I prefer to make a strong alcohol based tincture with no water added until use. Others use a water/alcohol blend. Starting with either fresh or dried single herbs, pack plant material into a glass jar. Fill to the top with 80/100 proof vodka or rum. Besides extracting the plants active ingredients, alcohol acts as a preservative. Alcohol tinctures will keep 2-3 years. Cover and set aside for 3 weeks, shaking daily. If using a fruit or wine press, empty the contents of your jar into the press and squeeze the plant material to remove all the valuable liquid. Additional straining through cloth may be needed to remove smaller sediment. Bottle and store. If you don't have a press, simply strain through a cloth lined colander and press by hand. Tinctures are mostly taken orally. The easiest way is to place 2-4 drops under the tongue 3 times a day. (See dosage adjustments above) The strong taste may not appeal to everyone so the drops can be added to tea or other beverages to disguise the vodka or bitter taste of some herbs. Hot tea will remove the alcohol. That's something important to remember when using the remedy with children or those who are intolerant to alcohol. Use caution in pregnancy. Glycerites - basically the same as a tincture but using glycerin as the menstruum, instead of vodka or rum, creating a non-alcoholic version. Glycerin tinctures typically keep well up to a year. Extracts - either of the above methods of capturing the active medicinal properties of herbs are considered extracts. They can be used to flavor foods, are aromatic and healing. Infused Oils - These can be made with a simple herb or an herbal blend. When I make first aide salve, I blend all the fresh herbs together to make the infused oil. Hot method - Using a 1:1 ratio of herbs to oil, add both to the top of a double boiler or a glass bowl over a pan of boiling water. Gently heat the mixture for 2-3 hours. Strain, press and store. Cold method - Pack a large jar with the herb of choice. Cover with oil. Cap tightly and allow to steep for 2-3 weeks in a warm, sunny place. For a stronger brew, use the once infused oil with new plant material and repeat the process. Strain, press and store. These oils can be used for aromatic, relaxing massage oils, and as a base for salves, ointments and balms. We'll talk about other uses for infused oils later in the series. Herbal oils can also be created by adding Essential Oils to a base or carrier oil. I find that castor oil and rosemary EO makes a good sore muscle and gout treatment. Here's a little fun Herbal Tidbit: When my husband had a gouty attack this past summer, I went out to my stinging nettle patch to pick some for a fresh poultice. On the way back, after stinging myself a few times while picking the herb, I remembered reading about the Romans beating themselves with nettles (urtication) as a folk remedy for arthritis and rheumatism. Hmmm...Gout is a form of arthritis, right? Mmwaa ha ha ha....! It's a simple process to make many herbal remedies and most don't require a lot of special equipment. Many ingredients can be found in your pantry. If you'd like, you can grab my button from the sidebar to share with others. Just copy and paste the html text onto your site or post. This is my favorite rub to use for all our colds. I just stopped by from Monday Mania and have a question- sorry if I somehow skipped over the answer! Is the medicine chest link-up something you do regularly or is this the only page I need to bookmark? I don't want to miss anyones contributions! Thanks! Hi! Thanks for dropping in. This weeks post (#7) will be a little late but if you go to the Herbal Medicine Chest page, all the posts from this series will eventually end up there and you will be able to find them or link to them from there or from the archives. All related posts will contain the title "Herbal Medicine Chest" so you could also do a search. Hope that answers your question. BTW, when the hop is over, I'll compile all the recipes from the linky and comments on the Medicine Chest page as well as some of my own. The stinging nettle recipe would be especially handy to use when you're annoyed at someone! ha! This is going to be a neat series! Can't wait to see what you have to share! Thanks for linking to Alphabe-Thursday's letter "H". Hi - I just found your site & love the info. I am wondering what the shelf life is for a glycerin based tincture? Thanks! 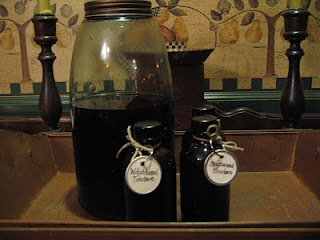 @Carol Glycerin tinctures should keep well for at least a year. I'm glad your gout remedy worked.